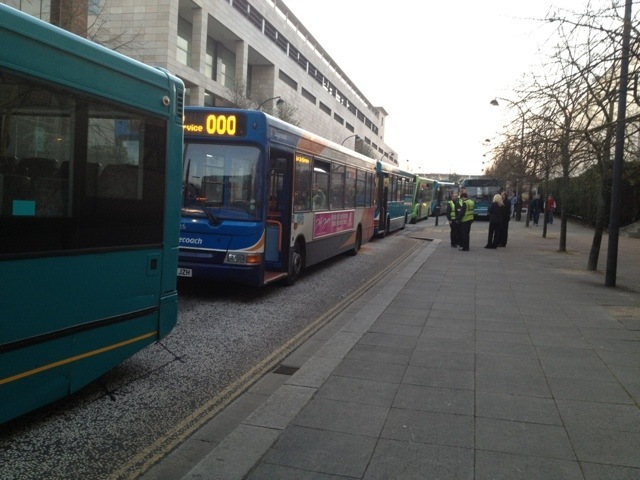 News reaches me that a bus jam involving quite a number of buses took place in Lower Ninth Street in the City Centre this evening about 1800. Looking at the picture I think it’s safe to say there will have been some disruption to most routes. Seems a bus broke down in the single lane section and couldn’t be moved/rolled out the way. Some bus services will be changing from 22nd April 2012 within Milton Keynes. Below are some general details, I’ll link to timetables once they are all available. • This service will be simplified to run only between Bletchley, CMK, Newport Pagnell and Lavendon. • Fenny Stratford will be served by MK Council Service 18, operated by Z&S International during Monday to Saturday daytimes. • Newton Longville will be served by revised Service 32, running under contract to Buckinghamshire County Council. • The section of route between North Crawley and Newport Pagnell will be provided by MK Council Service 37, operated by Soul’s. • This service will be re-routed between Newport Pagnell and CMK to serve Redhouse Park. It will also be re-routed to run directly from Grange Farm to Westcroft Centre. • Oxley Park will be served by revised Service 8. • The frequency of Service 2 will be increased to run every 15 minutes for the main partof the day on Mondays to Fridays and Arriva will run the weekday evening journeysunder contract to MK Council. • This service will no longer run. • Woburn Sands will be linked to Kingston and CMK by Platinum 300, running up to every 30 minutes on Mondays to Saturdays and hourly on Sundays. • The Open University and Monkston will be served by newMK Council contracted Services11/12, operated by Z&S International. • There will be minor changes to the Sunday timetable to improve reliability. • This service will be simplified to run as a one-way circular service between Kingston and Walnut Tree, Browns Wood and Old Farm Park. • The route will be extended from Westcroft Centre to offer a simplified and improved service to Oxley Park. • Arriva will run all journeys on Mondays to Saturdays and during Sunday daytime. • The section between Kingston, Browns Wood, Walnut Tree and Bletchley will be replaced by new Service 9. • This new service will replace Service 8 between Kingston, Walnut Tree and Bletchley, running hourly for the main part of the day on Mondays to Saturdays. • There will be a number of adjustments to the timetable for these services. • This service will be revised to run from Buckingham Tesco and Buckingham Centre to CMK, Bletchley and Newton Longville. The route will run in both directions and not as the current circular service. • Some journeys will run via Maids Moreton and Burleigh Piece to replace Service 32A. • This service will no longer run, being partly replaced by Service 32. • This once-a-day service will no longer run. • The frequency will be increased to run every 15 minutes on Mondays to Saturdays between MK Station and Coachway/Kingston and will be extended to every 30 minutes to both Magna Park and Woburn Sands. • On Sundays this service will run every 30 minutes to Kingston and hourly to both Magna Park and Woburn Sands. I know I haven’t posted a lot lately, but there has been a lot going on in the background. I hope to be able to tell you more soon, but there are some exciting changes happening with the blog, and with me. In the meantime there may be a lack of posts while the changes take place (one of them could be pretty big!). More details soon hopefully!! May even try a Blog post from it!